At the Japan Day celebration on May 2, (left to right) freshman Disney Sato, sophomores Josie Losh and Jessica Uehara performed. The event offered participants a glimpse into Japanese culture such as traditional food, artwork and performances. The MPR was overflowing with the smell of yakisoba noodles, the sounds of large drums and students immersed in another culture for Pacific’s Japan Day on May 2. Those who attended were entertained with several different kinds of traditional Japanese music and even the current popular songs in Japan. While being entertained, students could sit at a table with different papers and ink to create their own Japanese calligraphy piece. Several tables of food for purchase included noodles, and different options to personalize your own sushi. Once again, Japan Club organized the event, under adviser Kazuko Ikeda. Students involved in the club helped prepare the food, set up and also took part in all of the performances. It was surprising that the event would be easy to plan, considering the variety of dances and music involved. Manner was part of the group that performed a traditional Japanese dance with drums from Okinawa. She also played traditional Japanese taiko drums alongside other students for several musical numbers. Most of the dancers began practicing in March. However, for the dances that were not traditional but reflected current popular music, practice began much sooner. 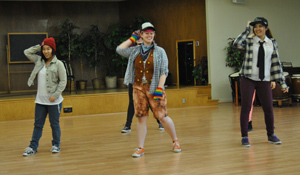 One group performed to Korean pop or K-pop and had only begun practicing a week before Japan Day. “It was a last minute performance but it worked out well,” said Manner, who also danced to Japanese pop group AKD48. Although performing may have been a breeze, Manner said other difficult decisions swarmed the planning process for Japan Day.The delicious foods that were offered were actually only a few of the options originally available according to Manner. Although Ikeda is retiring after this, her 30th year as a Pacific faculty member, hopes and expectations for future Japan Days still exist.